Last Saturday, we took the Little Bee Man to Woodland Park Zoo to check out their annual “Bear Affair” event – a weekend dedicated to raising awareness about native bear species in Washington State. As part of the exhibit, Zoo staff staged a “non-safe home” demonstration: They outfitted the Grizzly Bear habitat in the Northern Trail area of the Zoo with things you might find in many back yards: A barbecue grill, a chicken coop (complete with mock chickens but real feathers and chicken meat), unsecured trash cans, pet food, bird feeders, leftover pizza, etc. The real contender however, and the main reason I wanted to see the demonstration, was a bee hive containing some frames of wax comb with live brood and honey inside. The deep super, bottom board, lid and yummy contents were generously donated by my colleague Corky Luster from the Ballard Bee Company. Chris Morgan, bear biologist and wildlife ecologist, of PBS’s “Bears of the Last Frontier” fame, was on hand to narrate and color commentate the bear action. 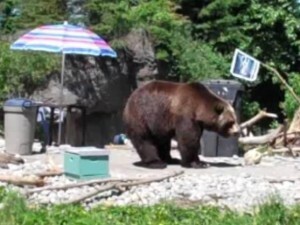 Earlier that morning, Zoo staff had set up a mock campsite in the same area, complete with tent and unsecured food stores – a classic mistake novice campers make all the time in bear country. We weren’t there for that demonstration, but from what I heard the bears made short order of the campsite as well. This entry was posted on Tuesday, June 7th, 2011 and is filed under DanTheBeeMan. Both comments and trackbacks are currently closed. The bees were supposed to be ready for pickup by this weekend. However, I just got a call from the apiary, and there was a problem with their supplier. It’s going to be another week. Bummer. © 2009-2017 Dan The Bee Man. All rights reserved.